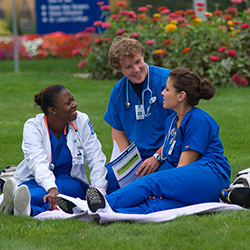 St. Luke's College is located on the campus of UnityPoint Health - St. Luke's in Sioux City, Iowa. Offering health system-based education in a dynamic setting, the campus houses classrooms, practice laboratories, faculty and administrative offices, computer laboratories, conference rooms, student lounges, a library and bookstore. Ample parking is also available near the college buildings. Student lounges are located on second and third floor of the College Building located at 2800 Pierce Street. These areas offer students the perfect place for a study break, a meal break or some casual conversation. When it's time to study, students can take advantage of the computer labs located in the Library area of the College. The campus is also wireless so students can access the internet when and where they need it most. Hands-on experience is prized by St. Luke's College and therefore our dedicated skills labs are utilized for simulation and multi-skilled, multi-bed experience. In addition, students gain real life experiences in clinical settings at UnityPoint Health - St. Luke's and various other sites. The college's library serves as the health science library for both the college and the hospital. As an academic and clinical library it serves students, faculty, physicians and employees of UnityPoint Health - St. Luke's, as well as patrons of Sioux City and the surrounding community. This is our time of need for your support. The faculty and students at St. Luke's College need your compassion and your generosity to assure that they are teaching and learning in an environment of the caliber that reflects the quality of care that they will give to their patients for many decades to come. Second and third floors of the former Physician's Center One, now the College Building, have recently been renovated. This space allows us the opportunity to increase our learning space and hands-on skills laboratory while also allowing for future program expansion.The future plans would include the renovation of the fourth floor to create a general science and medical science lab. We hope you will join us in creating an effective teaching and learning environment that reflects our heartfelt devotion to ensuring a bright future for healthcare in Siouxland for years to come. For more information on how you can get involved, please contact Mike Stiles at (712) 279-3148.